One of our proudest moments, Simba, offspring of Finland & Africa, won Top Dog Model 2012 which was broadcast on ITV2 between Sept 2012 and Oct 2012. Out of over 2500 contestants he came through to win the prestigious title! Daniel with his gorgeous Simba (Africa litter 16) will be appearing on ITV’s Top Dog Model show due to be screened on ITV2 on 5th Sept. The winner earns a dog modelling contract for a year. They were recently on ITV’s This Morning program follow the link to view…..
http://www.itv.com/thismorning/styleandbeauty/glamour-dogs with Phillip Scofield and Paul Ross presenting. Simba is only 13 months old and is our hooligan Cuba’s brother. Considering his age he has done remarkably well!! 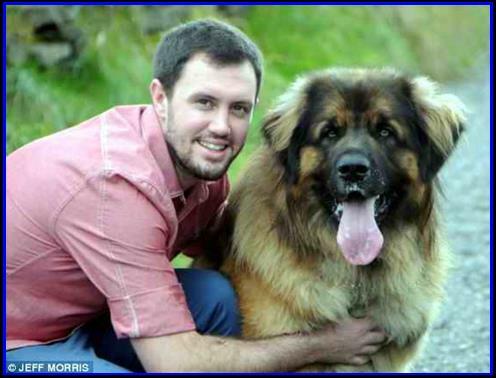 He did the Leonberger proud on the show, with Paul Ross obviously a big fan!! 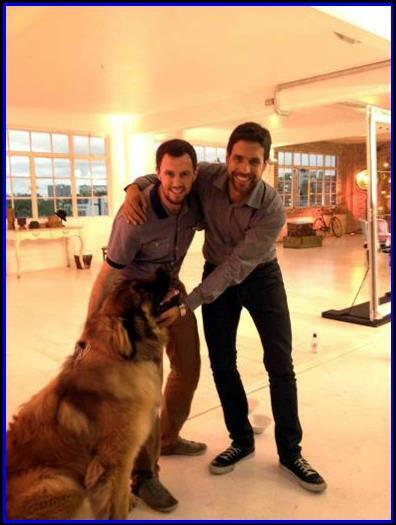 Don’t forget to watch Africa & Finland’s ‘little boy’, Simba with owner Daniel on ITV2 @8pm TONIGHT for Top Dog Model, first of 6 parts to find a winner of the prestigious title and contract at the end! Simba wooed the judges sufficiently to get through to the next round, looking particularly stunning during his photo shoot…. How could they not put him through! Well done! He was up against the usual ‘glamour’ pouches, who if their owners could would have given them all fake tans! One thing that did shine through was Simba’scharacter, full of mischief and fun, just what us Leo owners know and love about our dogs. Here’s hoping he does well in the next round next week. Simba has round 2 on ITV2 @8pm tonight for Top Dog Model hope he does well! Simba made it through last week to the final 6 contestants out of a huge 3,000 entrants!! 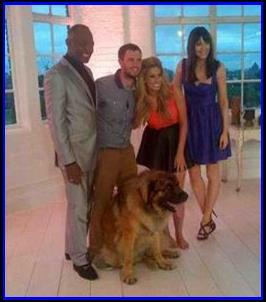 Simba has round 3 on ITV2 @8pm tonight for Top Dog Model don’t miss it. It is getting very close to the point where you begin to realise with only 6 contestants remaining that he has a real chance of winning it! Being very similar in character to our Cuba we are half expecting Simba to do something outrageously funny but disastrous at any point that would unfortunately scupper his chances!! We hold our breath~! …… He does look gorgeous representing our beautiful breed … so proud whatever happens. Simba is now through to the final 5 !! It was a close shave last night as Simba’s naturally exhuberant character shone through at the wrong moment lol ! The final edited advert was easily one of the best so they both did well to wing it at the end. Problem is a normal sofa like that one is far too easy for a Leo to walk over as though its not there, let alone a petite Chihuahua to jump onto! What a contrast, it was fun and very amusing. With the competition getting so advanced now you can see the strain on the owners faces as it has gone past the ‘just a bit of fun’ stage as they realise they are all so close to the end and really want to win! Next week sees film taken underwater …. rather handy considering the Leonberger’s water prowess! It is getting a little nerve racking now as there are only 3 rounds remaining before the TDM (Top Dog Model) is decided. Unbelievably Simba is now through to the final 4 of Top Dog Model!! The task of water photography fell into Simba’s lap this week as one would of expected with him being a Leonberger! 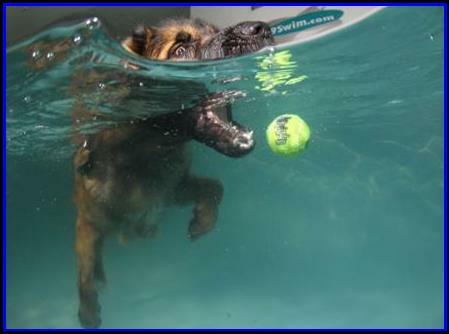 He took to the water like errrr…… a Leonberger …. and impressed everyone with his confidence and ease in the water. Fantastic! Last week you felt like he could be the one to leave the competition, this week as it proved you felt that he could be top dog. 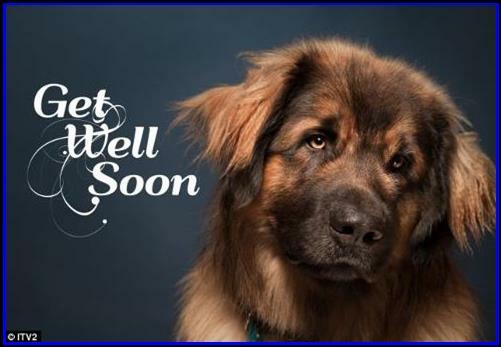 Simba and Daniel are growing in confidence with each task and many Leonberger owners are now watching each week transfixed to see how their beloved breed gets on …. Truly inspiring stuff! Daniel, Christine and Simba (and their two gorgeous Chihuahua’s, Lord and Ellie) popped over for a visit the other day to say hello to mum & dad and we had a great day chatting about Leo’s and then went for our daily walk over the moors. Finland was remarkably reticent about his son’s visit considering it was essentially another rival male in the house, with his mum Africa keeping her son in check when he got too boisterious! So lovely to see, she is so adorably feisty! They all got on so well. We are unanimous in thinking that Simba looks most like his aunt China as you can see from the front page photo, especially his striking eyes. We also have Maya (Africa’s sister) being rather possessive of her birthday toy, a cuddly duck!! Lovely picture. We are trying to get a good picture of our new girl, Mali, but she is camera shy and moves to quick! We shall get one soon…. Harper goes swimming, some great pictures captured by the owner….. I can hear the ‘Jaws’ music in the background…..!! Simba has won Top Dog Model !!! 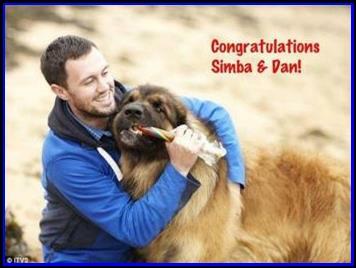 Congratulations to Simba & Daniel !! We all sat and watched the final last night and our son, Bradley was so overcome with joy that we all were all in tears as the result was announced as he jumped around the room! To say we are proud is a complete understatement; we are overawed with Daniel’s and Simba’s achievement. He has beaten nearly 3,000 entrants for this competition, of all dogs shapes and sizes. To think that we bred such a beautiful dog and now the world knows what a fantastic breed these dogs are is truly awesome. All through the series Simba came across as not the best behaved or best trained; much more important he came across as what all of us would have wanted ….. he was boisterous, fun, mischievous and completely adorable. He stole the judges hearts as they have stolen all of our hearts when you get your first 8 week old bundle of mischief called a Leonberger. It was summed up at the end when Stacey Solomon insisted on a Leo cuddle, something we are privileged to experience everyday. We have had so many lovely comments made to us from so many people that we would just like to say a big THANK YOU for following Simba and getting as excited as we have in following his progress in the competition. We all related to the lovely relationship that Daniel and Simba portrayed, our own Leo’s giving and bonding with us like no other. In a close run final first the gorgeous Rottweiler, Scarlett was eliminated unexpectedly due to a time limitation so it was down to just Simba and the very cute Chihuahua, Lucky to fight it out. The beach episode again had us in fits as Simba went walkies for a while as all the temptations of the scene around him proved to be too tempting for a while for an inquisitive 14 month Leo! As usual, and this is what eventually swung it Simba’s way; the final result was always stunningly good. He always produced an amazing photo/video even after all his antics, and that picture was always enough to sell a million ice cubes to an Eskimo! Lucky the Chihuahua was simply outstanding in almost everything he attempted, so it was a very close run contest but Simba’s sheer presence and ‘wow’ factor just stole the day. Simba’s next appearance could be on the Jonathan Ross show on this Saturday 13th October @10:30pm and hopefully the edited version will featureSimba and Daniel and be as funny as the actual show was apparently!! After the euphoria of Simba’s triumph in Top Dog Model, followed by his brilliantly funny appearance on the Jonathan Ross Show it has been a bit miserable with lousy weather and no Wednesday night to look forward to!! Simba was truly marvellous on the show, with Jonathan Ross game for a laugh as usual trying to emulate Daniel’s carrying routine with Simba on his back. He failed miserably with Stacey Soloman commenting ‘you are so feeble!’. Within a couple of minutes of arriving on the set he was on his back demanding a belly rub from Jonathan Ross! Nothing could make you so proud as his confident and exuberant character mesmerised everyone on the program. If you missed the show then follow the link to You Tube http://www.youtube.com/watch?v=kniaLVmKxLY . Simba & Daniel have been asked to be judges at the Earls Court Discover Dogs show 10th & 11th November 2012. No doubt we shall see quite a bit more of the gorgeous boy in the coming months as he is asked to attend events now that he is a celebrity! http://www.discoverdogs.org.uk/ for more information about the days events.